Is a cashew a legume or a nut? Technically, it is neither. Instead, it's a thick-shelled seed with an interesting story. Nuts and legumes may seem similar. Botanically, legumes grow in pods, which house multiple seeds. Examples are pea pods and green beans. Other differences include the fact that a nut does not open on its own, but a legume does. Legume seeds are often attached to their pods, while a true nut is never attached to the "ovary" wall. With these specific differences in mind, consider the cashew tree. The cashew tree is a member of the evergreen family that grows an edible, pear-shaped fruit known as a cashew apple. The apples can be eaten fresh or processed into juice, jams, jelly and other products. They are a respected source of vitamin C. The reason you probably haven't heard much about the cashew apple or seen them in the produce section of your grocery store is that the fruit spoils so quickly. It can only be eaten fresh from the tree because it starts to ferment after only 24 hours and is too perishable to export to the United States. No matter how you answer the question, "Is a cashew a legume?" the fact remains that cashews are known as nuts in the culinary world. The culinary definition of a nut is a large seed that comes from a shell and is used for food. This definition includes seeds that are not technically nuts, such as cashews. Cashews grow in a unique way. 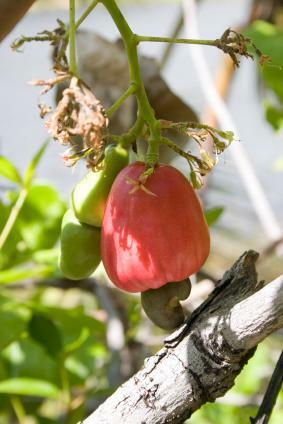 When the cashew flower blossoms, a nut forms, and the apple grows between the nut and the stem. The fruit takes two months to ripen, and must be used within 24 hours of picking. The cashew nut that grows at the bottom of the fruit, however, can be stored for a year or more without spoiling. This "nut" is really a thick-shelled seed. Harvesting can be tricky because the outer part of the shell can cause dermatitis in some people due to the poison oak allergen it contains. If that doesn't complicate harvesting enough, the inside of the shell also contains a toxic resin, which makes opening the shell problematic. If it isn't done right, the cashew become inedible. Steaming is the most common method of opening the shells, but the high temperatures cook the nut inside. That creates a problem for people who want to by raw cashews, like those following a raw diet. Many cashews labeled as raw have actually been steamed during opening. There are companies that have special utensils designed to remove the cashew shells without steaming, so raw cashews are available but hard to find. If raw is important to you, you'll have to do your homework to learn whether or not the steaming method was used in processing. Raw cashews are available online through stores such as The Raw Food World. Cashews are renowned for their high fat content. People often avoid them because they are "fattening," but nuts eaten in small amounts are nutritious and healthy. Cashews are a source of B vitamins, essential fatty acids, protein, fiber, and more. They make a healthy addition to any diet and can be used to make gravies, nut butter, creamy desserts, and other vegetarian and vegan-friendly dishes.